The Hicca Way at ArleseyWalking RouteThe choice of name for this path which meanders along the River Hiz is based on history going back to the days of King Offa of Mercia who founded a religious settlement in Hitchin. The path follows the route the Hicca tribe would have more or less followed from Hitchin to the Danish Fort near the south east corner of Henlow. The linear route allows for the return trip to be made by train. From Junction 10 of the A1(M) turn on to the A507, and from Bedford take the A660, then the A507. A commuter car park is available west of Glebe Meadows at Arlesey. 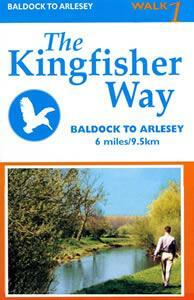 This linear walk can be started from Arlesey Station (or from Hitchin). The choice of name for this path which meanders along the River Hiz is based on history going back to the days of King Offa of Mercia who founded a religious settlement in Hitchin. The path follows the route the Hicca tribe would have more or less followed from Hitchin to the Danish Fort near the south east corner of Henlow. The linear route allows for the return trip to be made by train.